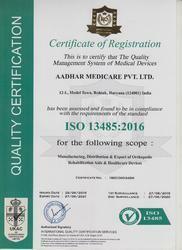 Established in the year 2013 at Rohtak (Haryana, India), we, “Aadhar Medicare Pvt. Ltd.” is one of the prominent business organizations, engrossed in manufacturing, exporting a wide range of Ankle And Foot Supports, Body Supports And Belts, Cervical Supports, Finger Supports, Fracture Aids, Gel Products, Knee Supports, etc. These products are designed by our adept professionals using advanced machine and premium quality material in line with the set quality standards. Also, these products are checked on well-defined parameters, before their final delivery. Provided products are extensively demanded in the market, owing to their outstanding features simple usage, high strength, premium quality, and durability. In order to ensure the high quality of products, our quality inspectors checked these products on well-defined parameters. We have constructed a sound and strong infrastructural unit over a huge area of land, in order to perform all our business operations in a well-organized manner. This unit is segregated into diverse departments such as procuring, production, quality testing, packaging and much more. To meet the specific requirements of our clients in most appropriate manner, these departments work in sync with each other. We have been able to carve a preeminent topology for our organization. 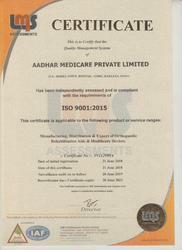 With a motto of “Supporting Lives Globally”, we at Aadhar Medicare strive to offer that never ending ‘support’ to the patients with our high-quality Rehabilitation & Orthopaedic Aids, under the brand name of NEOLIFE. Our company is blessed with the state-of-the-art infrastructure unit that is outfitted with all contemporary machines and this unit is managed by our skilled and well-qualified professionals. For enabling utmost possible operational efficiency, we have segregated our unit into several sections including manufacturing, quality testing, packaging, research & development, administration, and logistics. 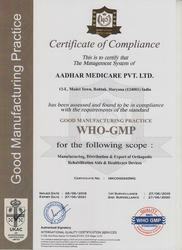 All these departments function in a synchronized manner and are efficiently managed by the team. We have our own brand namely NEOLIFE.